It's such an exciting time of the year right now, as people all over the world are preparing to head off to University. 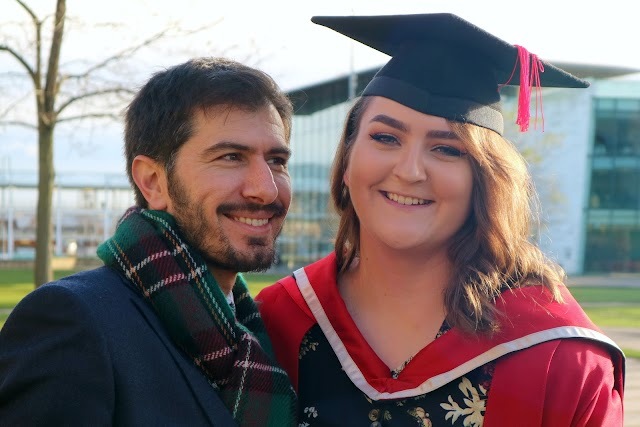 As it's been over a year since I graduated and I'm also about to go back to Uni to do my Masters, I thought I'd tell you about an aspect that I was ridiculously excited for when I first started - decorating my University accommodation! Now, I'm assuming that it's pretty similar for a lot of other people, but during my first year of University, I stayed in halls, which is like a massive dormitory building. I had a little room with four blank walls and I wasn't able to paint or hang photo frames up, so I spent a lot of time on Pinterest, looking for ways to jazz it up without breaking the rules. Back then, I didn't have Printiki, the fabulous photo printing service! But now that I do, I've put together 3 really simple projects using their prints* to add a bit of personality to your University accommodation. With Printiki, you can print photos from Instagram, Facebook or by uploading them from your computer, and you can select a range of styles for them to be printed in. 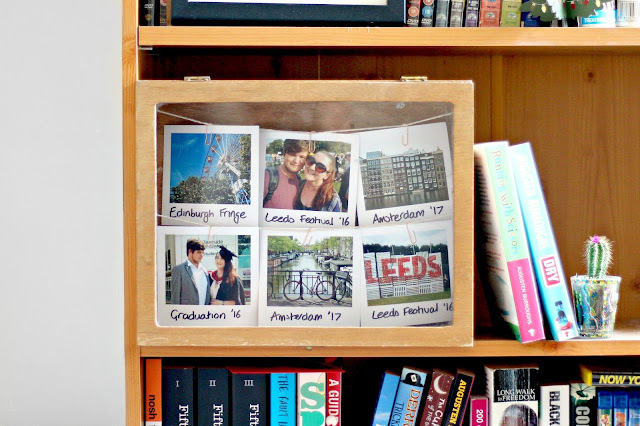 Now you don't need a Polaroid or an Instax to print those cool, white-bordered photos! There's a choice of finishes, so you can have matte or glossy photos, and the shipping is super fast. And what's even better than all of this is that you can get free shipping by using this code: XADRDUE4. That's right, you won't have to pay a penny! First up on my list is a mood/inspiration board. I'm not sure if this is the norm, but in my University accommodation, there was a small cork board in each room, but if you don't have one, you can easily pick one up from a craft store or online. Once you've got your board, all you'll need is some prints of happy memories or things relating to your course, some magazine cutouts if you wish and some drawing pins. Then you can go crazy, pinning bits and bobs all over, deciding your own layout and colour theme. 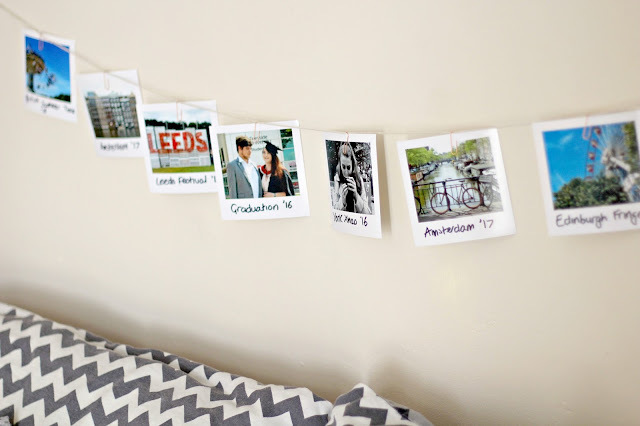 This is such a simple way to add a personal touch to your room and it doesn't damage the walls! You could rest it on your desk or bedside table, or if it's very light, you can use white tack to stick it to the wall. 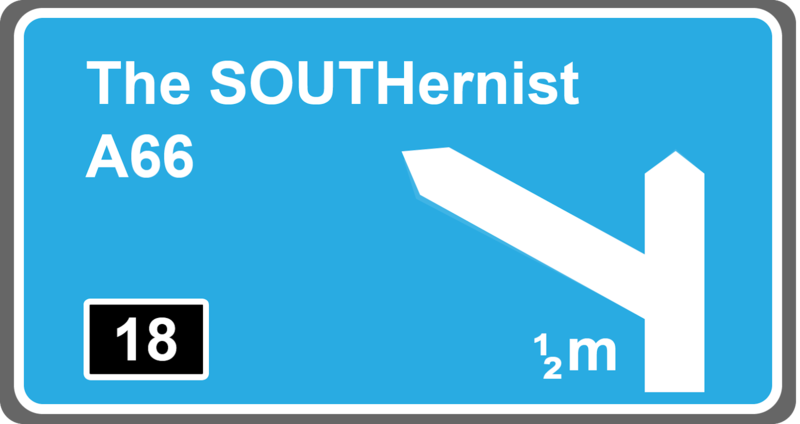 This is also something that you can carry on when you leave your accommodation. 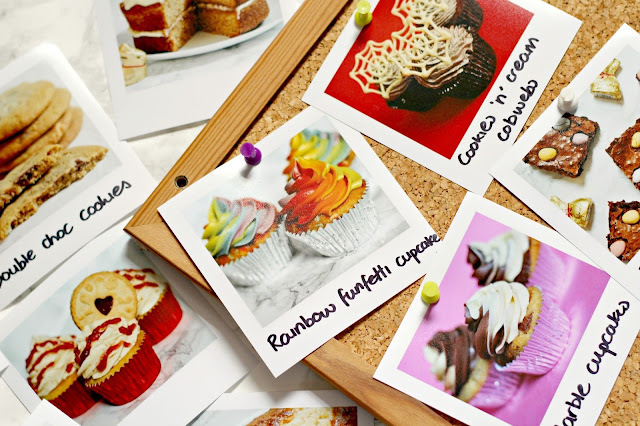 As you can see by the image, my mood board is covered in cakes and that's because it's sat in my kitchen, designed to give me some baking inspiration! 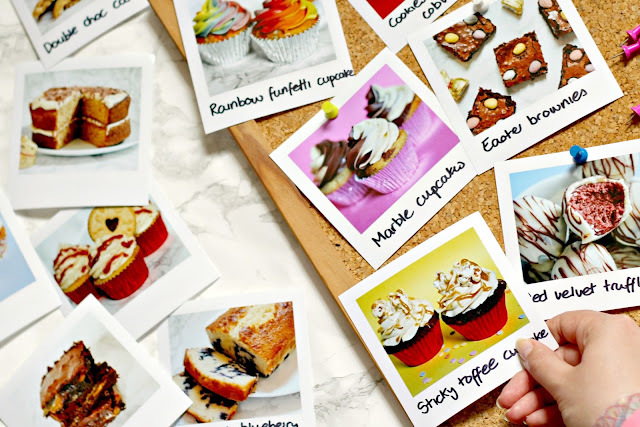 If you'd like to read a great post about making a mood board then take a look at this one by Kyia from Wanderlust Girl. This idea is even simpler than the first and requires hardly any effort at all! All you need for this is a bunch of prints and some washi tape, either in various colours and patterns, or all the same. 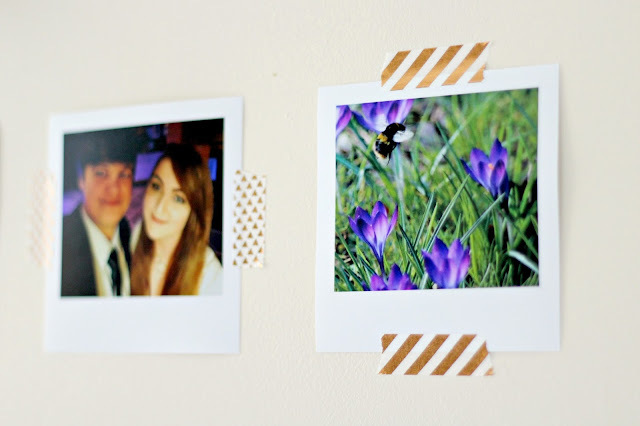 I never used to appreciate washi tape and thought it was a bit of a gimmick, but as soon as I stuck my prints up on the wall, I just fell in love. I opted for a strip with white and metallic copper stripes, and another with metallic copper triangles, and each roll was less than £2 from eBay, but again, you'd be able to find plenty in your craft shops. The good thing about washi tape is that it doesn't leave any marks, unlike blue tack or sellotape that might cause the paint to flake, whilst adding something really gorgeous to look at. You can be experimental with the way you apply your washi tape to the prints, but I opted for a strips of the stripy tape on the top and bottom of one photo, then strips of the triangle tape on the sides of the next and so on. You could do tape all the way around or just across the corners - it's totally up to you! Not only can you experiment with the tape, but you can also play around with the amount of photos you use and their layout. As you can see, I only used five of my prints and kept them in a straight line with a fair amount of space in between. However, I've seen people use LOADS of prints and stick them all up in a grid which looks gorgeous, or you could stick single prints up in certain places all around the room. This is definitely one of the most customisable (is that a word?) projects in this post, making it one of my favourites. Finally, we have the absolute classic that we see all over Pinterest, the print garland. All you need for this is some prints, string, paper clips (I found these gorgeous rose gold ones in Hobbycraft) and a way to stick the string up, maybe white tack or washi tape. Measure out the amount of string you need, then clip your prints on in the order that you'd like. Stick the ends of the string up in the area that you'd like the garland to hang and you're done! This is such an effective way of decorating and looks even better if you string up some fairy lights nearby too. You can make the garland as long as you want and have it hanging as low as you like. If you have enough prints, you could even double up on garlands and stick one above the other to create a really fun piece of art. 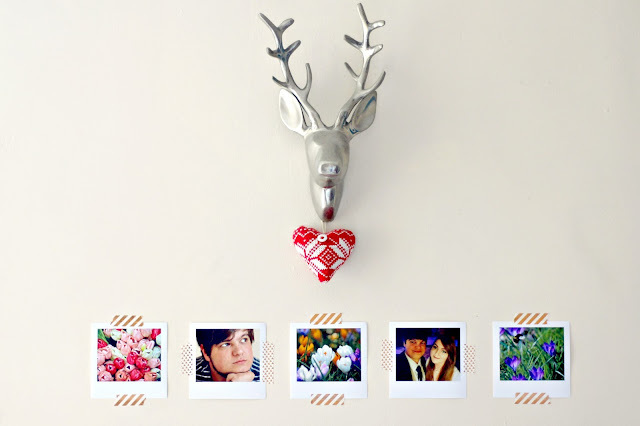 If you like the idea of the garland, but are stuck on space or don't want to stick things on the walls, I have another option for you! I happened upon this vintage Dutch cigar box at a car boot sale recently (for £3, what a bargain) and knew that it would make the most perfect shadow box. I did the exact same thing with the larger garland, but made two smaller ones instead and placed one further back to give a sort of 3D effect. Now I know that such boxes aren't that easy to come by, but all it really is is just a basic display box - a wooden box with a lid and glass front - so if you see one similar, pick it up and have a go! Also, I gave my best shot at cleaning the glass for this photo but it's so scratched up that I couldn't get it to look any better. I think it gives it a bit of character! 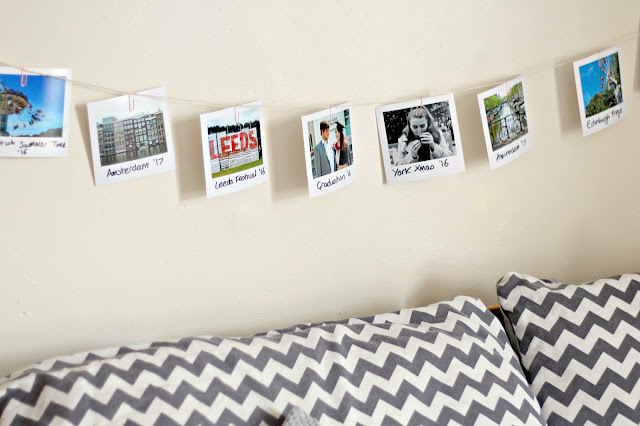 If you'd like to see more ideas of ways to jazz up your University room, then you can take a look at Printiki's Instagram - it's literally blogger heaven! I kind of wish that I could go back and live in my University accommodation, just so I can use these decorations in my little box room, even though I really love how they look in my house now. Thank you to Printiki for helping me out with this post and sending over a bunch of prints* to me. I found their service super easy to use, so I'm certain this won't be the first time you see them on my blog! Don't forget, if you'd like to get some prints with free shipping, then use the code XADRDUE4. Great suggestions! I've been watching loads of college move in vlogs on YouTube for this kind of inspiration- you've done a great job! These are great ideas! I love printing my photos off and having physical copies!